1 In Listening, use the example at the beginning of the first section to familiarize yourself with the sound, the situation, and the speakers. 2 Keep listening until the recording stops, looking only at the questions that relate to the part being played. 3 There are often pauses in the recording between different sections. Use these to prepare for the next set of questions. 4 Answer Listening questions in the order they appear on the Question Paper. Remember that they normally follow the order of the information in the recording. 5 At the end of the recording you have some time to transfer your answers to the Answer Sheet. Check your grammar and spelling as you do so. 6 In Academic Reading, begin by going quickly through each passage to identify features such as the topic, the style, the likely source, the writer’s purpose and the intended reader. 7 As you read, don’t try to understand the precise meaning of every word or phrase. You don’t have time, and those parts of the text might not be tested anyway. 8 Reading tasks sometimes have an example answer. If this is the case, study it and decide why it is correct. 9 Some tasks require you to use words from the text in the answer; in others you should use your own words. Check the instructions carefully. 10 The instructions may also include a word limit, e.g. Use no more than three words. Keep to this by avoiding unnecessary words in your answer. 11 In Academic Writing, you must always keep to the topic set. Never try to prepare sections of text before the exam. 12 Keep to the suggested timing: there are more marks possible for Task 2 than Task 1. 13 Organize and link your ideas and sentences appropriately, using a wide range of language and showing your ability (in Task 2) to discuss ideas and express opinions. 14 If you write less than 150 words in Task 1 or less than 250 in Task 2 you will lose marks, but there is no maximum number of words for either. 15 When you plan your essay, allow plenty of time at the end to check your work. 16 In Speaking, don’t try to give a prepared speech, or talk about a different topic from the one you are asked to discuss. 17 Always speak directly to the Examiner, not to the recording equipment. 18 Whenever you reply ‘Yes’ or ‘No’ to the Examiner’s questions, add more details to your answer. In each case, aim to explain at least one point. 19 Remember that you are not being tested on your general knowledge but on your ability to communicate effectively. 20 Organize and link your ideas and sentences appropriately, talking clearly at normal speed and using a wide range of structures and vocabulary. IELTS listening test lasts for about 30 minutes. It consists of four sections, played on cassette tape, in order of increasing difficulty. Each section might be a dialogue or a monologue. 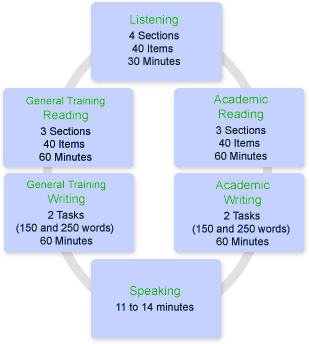 The test is played once only, and the questions for each section must be answered while listening, although time is given for students to check their answers. IELTS, the International English Language Testing System, is designed to assess the language ability of candidates who need to study or work where English is the language of communication. IELTS is jointly managed by the University of Cambridge ESOL Examinations (Cambridge ESOL), British Council and IDP: IELTS Australia. IELTS conforms to the highest international standards of language assessment.